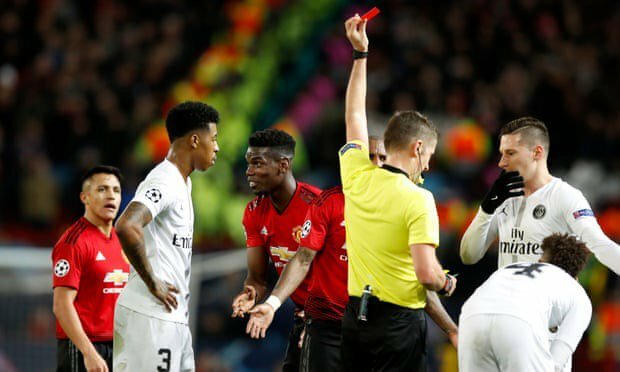 Manchester United midfielder, Paul Pogba, reacted angrily in the dressing room, after his red card against Paris Saint-Germain and issued an apology to his teammates, the UK Sun reports. Ole Gunnar Solskjaer suffered his first defeat since taking charge of United, as PSG sealed a 2-0 win in the first leg of their last-16 tie at Old Trafford on Tuesday evening. But United’s misery was compounded in the final stages of the game, when Pogba was sent off for a dangerous challenge on Dani Alves. Pogba will now miss the return leg in Paris. The France midfielder was furious with himself and took out his frustration on his locker, once he had got inside United’s dressing room. “Pogba was distraught and he apologised to all of his team-mates. “He felt as if he had let them down and he is now gutted to be missing the second leg. “He banged his locker in anger several times,” the report quotes a source as saying.